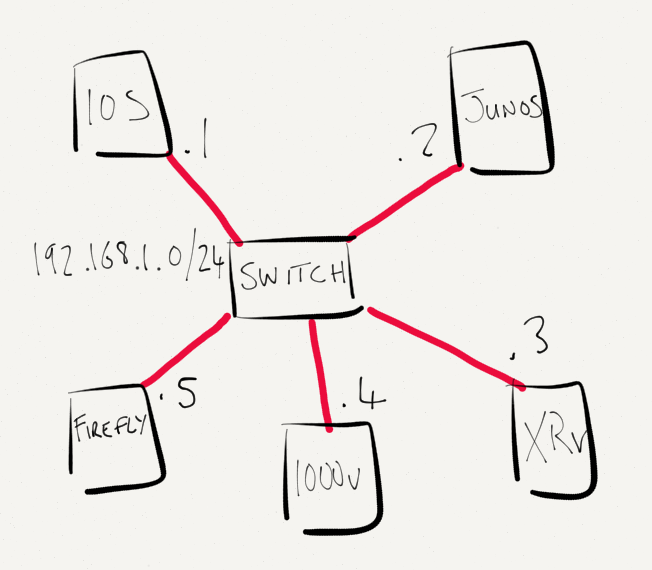 I’m working on a Juniper rollout right now, and this network will need to interop with routers and switches from other vendors such as Cisco. A mismatched MTU could result in something simple like an OSPF adjacency not forming, or cause layer-2 issues such as dropped frames. 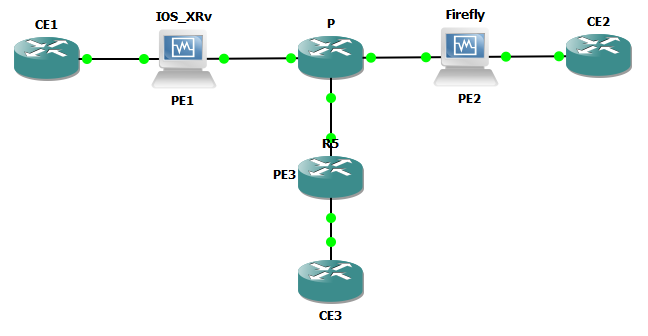 This post outlines the MTU configuration differences on Cisco IOS/XE/XR and Juniper Junos. Parts 2 and 3 will cover Jumbo Frames/IP MTU and MPLS MTU/802.1q tagged interfaces. Let’s remind ourselves of what an Ethernet frame looks like. You can see here that an Ethernet frame containing 1500 bytes of data actually places 1514 bytes on the wire, plus the CRC. So does that mean that the configured MTU is 1500 or 1514 or 1518? Is there a difference between the interface MTU and the protocol MTU? Let’s see! For the purposes of this blog I’m using the virtual topology below. OK, so lets start with IOS. The default physical MTU is set to 1500, but this does not include the 14-bytes of Layer 2 frame overhead. Note, the 4-byte FCS is never included in MTU calculations. The IP MTU is also set to 1500. Let’s see what this router places on the wire. Great – that’s exactly what we expected to see. We’ve confirmed that the MTU setting on IOS does not include the L2 headers and that setting the hardware MTU to 1500 on IOS enables 1500 bytes of protocol data. This is where things start to get a little different. The hardware MTU is configured including the L2 headers (not the FCS). Therefore if we want to allow 1500 bytes of protocol data, we must set the MTU to 1514. In the second command, IOS-XR tells us that we have an interface MTU of 1514, with 1500 bytes available to IP. The maximum ping achievable was with size 1500. 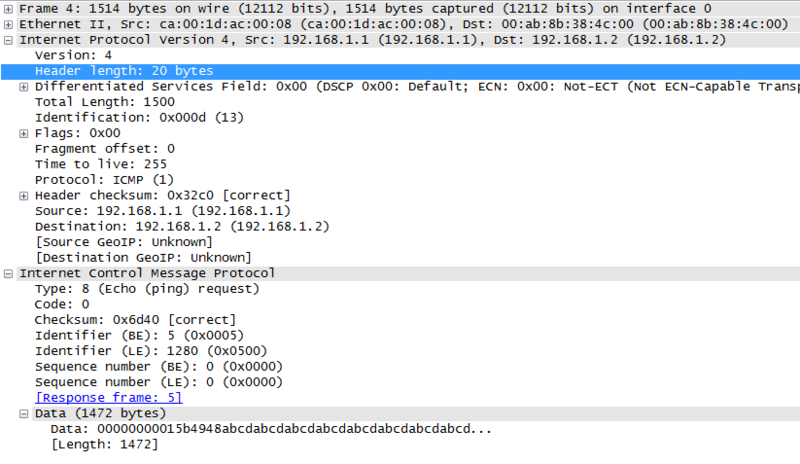 We can derive from this that the ping “size” is not including the L2 headers, but does include the IP and ICMP headers. 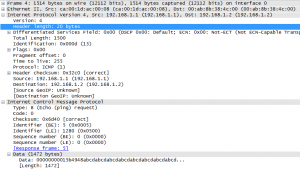 The packet capture should show 1514 bytes on the wire, which it does. On Junos the MTU includes the Layer 2 headers, again without the FCS. Therefore if we want to allow 1500 bytes of protocol data, we must set the MTU to 1514. The protocol MTU is derived from the interface MTU if it is not explicitely configured. Below we can see the interfaces MTU set to 1514 and the IP MTU set to 1500. What happens with a ping size 1500? Well that didn’t work. The 1500 on Junos is specifying the size of ICMP data only, not the data and headers. With that in mind, we’d expect a ping of size 1472 (1500 – 20 – 8) to be the maximum that will work. Let’s see. Just as expected. To double check the interface MTU setting of 1514, let’s check how many bytes the 1472 ping put on the wire – it should be 1514, which it is. We’d expect Firefly to be exactly the same – the Interface MTU should be including the L2 headers and therefore set to 1514 to allow 1500 bytes of IP data. Yep, this is exactly as expected, now for the ping. Again, 1472 should be the max. In summary, on IOS and IOS-XE, the interface MTU does not include the 14 bytes of Layer-2 headers. The configured value represents the maximum size of the encapsulated data. 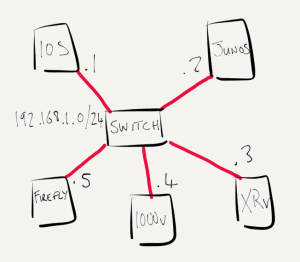 For IOS-XR and Junos, the Interface value must include both the data and 14 bytes of headers. The 4 byte FCS is not included.